The Vikings are fumbling and throwing interceptions at their highest rate since Mike Zimmer became coach, and haven't won any games this season when they've turned over the ball more than their opponents. Since Mike Zimmer became the Vikings’ head coach in 2014, preaching about his desire to build a smart football team that doesn’t beat itself with avoidable mistakes. the Vikings have largely heeded his call. They’d only turned the ball over on more than 10 percent of their drives in his first year as head coach (when they gave it up 10.8 percent of the time). Their turnover percentage ranked seventh, fifth and third in the NFL the past three seasons, and in each of Zimmer’s first four seasons as the Vikings’ coach, they’d never had more than six games when they’d lost the turnover battle. The Vikings already have four such games through the first half of this season, and in the process, they’re giving assent to one of the NFL’s oldest truisms: It’s tough to win when you turn the ball over. In fact, the only times the Vikings haven’t won this season have come when they’ve had more giveaways than takeaways. 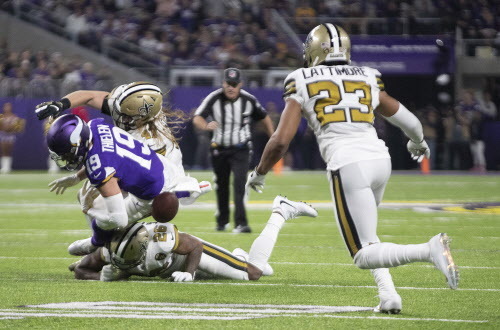 Video (02:42): Coming off Sunday night's loss to the Saints, Adam Thielen and other Vikings players talk about what they know went wrong. The Vikings are 0-3-1 when losing the turnover battle this season, after going 2-4 in such games last season. They’re turning the ball over on 11.1 percent of their drives this season — still the 14th-best rate in the league, but the highest of Zimmer’s tenure and a sharp increase over their 7.6 percent figure last season. It should be noted the Vikings have attempted 341 passes — the third-most in the league this season — and plays with QB dropbacks are historically more likely to result in turnovers than handoffs. According to Pro Football Reference, there have been 1,940 interceptions in the NFL since 2014, as opposed to 1,359 lost fumbles, and 48.5 percent of those lost fumbles have occurred on passing plays, as opposed to 31.1 percent on rushing plays and 20.4 percent on special teams plays. In other words, roughly 78 percent of turnovers in the NFL since 2014 have come on passing plays, when teams are dropping back to pass about 59 percent of the time in that stretch. Now, obviously, turnovers are a cost of doing business in the shift to a higher volume of passes, and teams have decided the benefits — a higher average gain per play, a greater chance of explosive plays, etc. — outweigh the costs of throwing the ball more often. Cousins has directed a more dynamic passing game than the Vikings have previously enjoyed under Zimmer. He has, though, historically been prone to fumbling: his seven fumbles lead the NFL this season, after he’d fumbled 31 times from 2015-17 in Washington. His interception rate this season — on just 1.2 percent of his pass attempts — is twice as low as in any other season in his career, and ranks sixth-best in the league this season. A replay review overturned what would have been a Marcus Davenport strip sack late in the third quarter on Sunday night, when officials ruled Cousins’ knee was down before Davenport dislodged the ball, but Williams’ interception return TD came four plays later, when Diggs stopped his route and Cousins threw the ball to the spot where he expected Diggs to be. Diggs said after the game he was trying to give Cousins a “relief throw” by sitting down in a zone, after seeing the quarterback was under duress, and the Vikings’ offensive line issues come into play here, as well: Through the Vikings’ first seven games, Cousins had been pressured on 39.8 percent of his dropbacks — the third-highest rate in the league, according to Pro Football Focus — and he was sacked four times, while taking a total of nine hits, on Sunday night against the Saints. That part of the problem might be the most pervasive because it’s the hardest to fix, though it was only a piece of the equation on Sunday night, when errors by Diggs and Adam Thielen loomed large. In any case, the difference between the Vikings having one of the NFC’s best records and them being in a fight for the division lead lies in part with their increased number of turnovers. In Zimmer’s time as head coach, the Vikings are 8-17-1 when losing the turnover battle. They are 6-7 when they’ve tied in the turnover battle, and are 30-6 when winning it. On Sunday, the Vikings will face a Detroit Lions team that’s only forced six turnovers this season. But they turned the ball over twice against a Saints team that only had five takeaways before Sunday night, too, and they’ll undoubtedly spend part of this week looking to curtail their giveaways.